Welcome back to exploring everything new in Lineage, our next release of Destined Legends. As you may have noticed, we're not holding anything back this time around. If you have been interested enough over the past couple months and have been reading along, I want to pause to personally thank you for your continued support. One of the aspects of Destined Legends we are actually most proud of is the aspect that has been hidden from everyone; the Lore. While designing the card, we considered adding what is known as "flavor text" to the cards. Flavor text is a small amount text, usually one line or phrase, that is used as a brief description or insight into the fiction of that card. We ultimately decided against flavor text for the Genesis series, as we wanted to avoid the clutter it would add to the card. We also decided that it simply couldn't do the Lore of the game justice. We struggled for a while to find an alternative method of sharing the Lore of the Destined Legends universe, and I think we have come up with the right answer. Another few things that led to our idea was our desire to incorporate collectability. We take pride in the design and artwork of our game, and are personally huge fans of collecting. A game isn't very collectible if you can buy every card outright on day one. This was an inherent challenge. Another small factor are fans who love the artwork and want to support us in a way that lets them simply enjoy the art, without having to learn how to play a game. At the end of the day, Destined Legends has rich developed Lore, and would make for an incredible story. As a way to satiate the various appetites mentioned above, this week we're announcing Destined Legends: Signature, a series of cards, that exist outside of the game. DL: Signature is presented as 251 cards (one card for every card in Lineage), but are a bit different that the game cards. For starters, there is no game. These cards are purely collectible. The front features full-spread artwork and little else other than the title and a border. 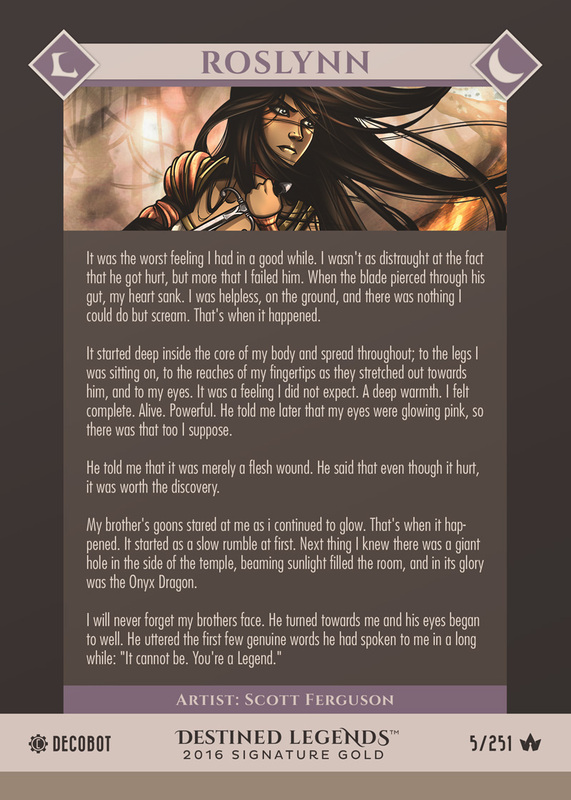 The back will feature a bit more information about the card, as well as a few paragraphs of lore we're calling "Stories". Stories are small anecdotes that are directly related to the card. They may feature anything from a narrative to a journal entry to a historical record. The idea that these small "stories" will piece together to form the overall story of Destined Legends. The point of DL:Signature is for it to be collected. This means that it will be sold through randomized packs of 12 cards. Each pack will guarantee a certain number of certain types of cards. The cards will also be printed on a higher quality of card that is optimized for the best possible print quality versus durability. You won't be slapping these cards onto table tops so its a trade off we're happy to make to get that much more quality on the card. We are also developing different card types like gold-sampled, foil-stamped, and holographic to represent the various rarities. The are much more details to go over, and we will in due time. We're in very early stages of development with this concept, so remember that much of this idea is subject to change. Speaking of change, next week is the big one. Next week we will be talking about what all of these revel updates means for you and how you will be contributing to the future of the game. We've gone over most of the big changes to the game, and with your amazing positive feedback, feel pretty good about what we have to share with you all next week. When we first thought up Dragons, we weren't sure how they would play into the game. We knew they had to be special, do a large amount of damage over a short period of time, and be seriously epic. We want them to be game-changers. When you see a dragon his the battle grid, I want you to think "oh crap, i better watch out!" Currently, the dragons depend heavily on randomized targets, there's no real way to strategize with them. We have given Dragons some major brain-time internally and think we've hit the magic with dragons for Lineage. In Lineage, dragons will have 3 abilities, just like a weapon card. The first two will be some combination of action ability, counter, or skill. This gives you direct control over the dragon, making them contribute to your battle strategy in a very tangible way. In addition to the two abilities is the the thing that will define your whole play style with the new Dragons, the "Final" ability. Every Dragon will have a "Final" that can be used to unleash massive amounts of damage to your enemies. After using a final ability, your Dragon is discarded. You can wait as long as you want before using your Final. You can use it immediately after summoning, or you can use it in a few turns, after suing some normal abilities first. But here's the kicker-- Your Dragon still has HP, and if it is defeated before you have a chance to use the "Final", thats it! You've just lost the chance to use it. So you will have to play smart and proceed with reverence. We have a really good feeling for this adjustment to dragon cards. I can't wait to get all of your reactions to some of the amazing abilities we've come up with for them. Here's an example of the Water Dragon in the new format. Oh and the Dragon's health will now scale through a few levels, making them a bit more versatile. Tune in next week, as we chat a bit about what we're planning to get you more of the lore of Destined Legends. This week's update is a bit of a tricky one. As you may know, the next series of Destined Legends is currently in development. There are some fun things we are working on in regards to creatures that still need to be ironed out. However, the general concept of what we're doing with Creature Cards was too exciting for us to pass up talking about. It is one of the cornerstones of the Lineage series and one we think will be a lot of fun. In series 1, Genesis, Creatures only ever possessed a Counter ability. This is because Creatures serve little more purpose than a means to level up. This time around, we're making Creatures much more interesting and much more relevant to battle. In Lineage, creatures will have two abilities. Those abilities may be Physical or Elemental attacks, Counters, and even Skills. This means that Creatures have to ability to attack targets outside of those who just attack them. Adding this to Creatures opens the doors to some pretty amazing possibilities in regards to gameplay variant. We have always had a vision where Destined Legends can be played in many different ways, and this helps to make that prospect an even more interesting one. The main driver of this addition is a new gameplay variant we are calling "Beastmaster." The basic premise involves you controlling one very special Legend, known as a "Beastmaster Legend" that has the ability to control Creatures. The variant will be one on one Player vs. Player, but in place of Weapons, you will be using Creatures to fight. We will have much more information on this gameplay variant including detailed rules in the coming months. In regards to that standard game, you can include the "Beastmaster Legend" of your element and utilize Creatures to your advantage in battle. I believe this will add a very dynamic and interesting new layer of fun to the game. There are still a few little surprises for us to summon up for you. Join us next week as we take a closer look at Dragons. This week in our deep dive into Destined Legends: Lineage we are touching some some cool new refinements coming to ability types and status effects. The most notable piece of feedback we got for Destined Legends was in regards to Direct Damage and Physical vs. Elemental abilities. The quick version is that Direct Damage was depicted by a large number in the right side of the card, next to the ability name. If the ability possessed this number, it meant that it caused "Direct Damage". This meant that the ability could be countered by the target it was performed on. If the ability didn't have a number, it cause "Indirect Damage" and it then wouldn't elicit a counter. ...Quite separately, we had a concept of "Elemental" and "Physical damage". The only place this mattered was in reference to "Blind" and "Mute" status effects, which would stop the use of physical and elemental abilities respectively, from the target affected. It also played into the positive status effects of "Wall" and "Aura", which again, reduced physical and elemental damage respectively. Common player feedback revolved around confusion of Physical and elemental damage and direct vs. indirect damage being related when they weren't. So we decided to simplify things. In Lineage, we are effectively dropping direct and indirect damage from our vocabularies. The new ability types are as follows. I think you will agree that it get rid of any confusion that may have been present. Another point to call out with this new assortment of abilities is that Counters themselves are no longer defined as "Physical" or "Elemental", therefore not affected by WALL, AURA, BLIND, or MUTE.This leads us to our new approach to Status Effects. "In Lineage, we are effectively dropping direct and indirect damage from our vocabularies." One of our own internal goals was to improve the pace of the game. Through our own internal testing, we found that player tracking of Status Effects over multiple turns, slowed things down. The culprit here is Permanent Status effects. Noticeable issues arose during upkeep. Sometimes we even noticed players often forgetting the progression of the Status Effect altogether. We spent some time trying to find a solution, and our solution is to shorten and intensify. We want the effects to feel immediately detrimental and require almost no tracking across turns. In Lineage all Status Effects last until the end of the affected target's next phase. Essentially, they are all Temporary Status Effects. 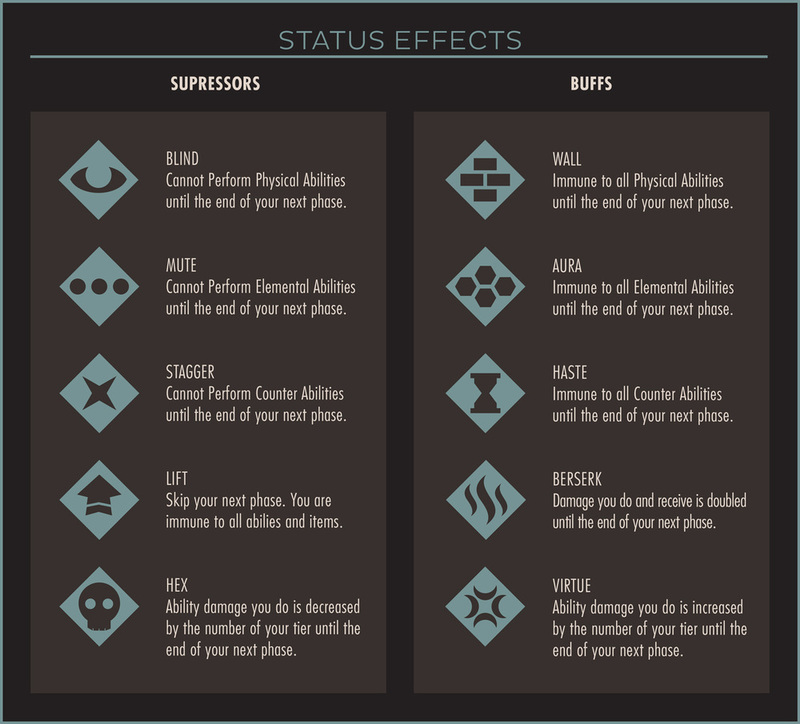 In addition to that, we decided to simplify Status Effects to a core set of essentials. Most Permanent Status Effects are being removed and the abilities that used them will be adjusted to provide alternative or more creative effects. "We want the effects to feel immediately detrimental and require almost no tracking across turns." This also allows us to cook up abilities that call for a certain Status Effect to be held over multiple turns until a specific other event occurs. Simplifying Status Effects in this manner helps keep things moving at a quicker pace, with less need for reference and tracking. Below is the list of Status Effects you will find in Destined Legends: Lineage. Keep in mind that this isn't a final list, and it may continue to grow and change as development continues. The newcomers are HEX and VIRTUE. As you can see they are opposites of each other, but they each play a very large role in the game, beyond what they already do. HEX and VIRTUE will act as markers, that proc specific ability effects. In the example below, you can see that VIRTUE plays into the different abilities, and also shows the complementary nature of the abilities in Lineage. There's lots more examples of this throughout the entire series and should make the weapons and their abilities feel more exciting and unique. Next week we open the doors wide open to Aggressive Creatures. I think there is plenty of hints right in that title (We're not being terribly cryptic here). Destined Legends was always separated into the six elements of Dark, Fire, Earth, Light, Water, and Air. The idea was to provide thematic variety but more importantly, to provide deep strategic choices. Each element provides a different play-style. The first series: Destined Legends: Genesis, featured the elements of Fire and Dark. This was chosen to provide players with fast-paced exciting gameplay as they learned the game. In developing the six elements for Lineage, we challenged ourselves to take a closer look at deck building. We asked ourselves why a player might want to incorporate a different element into a deck. The Sideboards in Series 1 began to explore this question and we knew we could take it to the next level. In Lineage we are introducing the concept of subclasses. This isn't a foreign notion to anyone who has played a recent RPG but incase anyone hasn't, a subclass is a strategic focus, defined by a theme or set of tactics. Each element is broken into two subclasses, a primary and a special. The primary will be the main method of dealing damage. They will be ideal suited for single target engagement, and will provide reliable outcomes for the sake of progression (especially though early levels). Each primary subclass remains unique and will still play to the element's strengths and strategy. The special subclass is the core of that element's strategy. It is what makes that element unique and formidable against its enemies. This is where the elements diverge the greatest in terms of variety of abilities and strategic impact. Dark and Fire are designed to be heavy on the offensive and damage over time, with little reliance on defense. The theory is that with a strong and relentless offensive, little defense is needed. Earth and Light both have the ability to perform strong amounts of damage when needed, but shine when it comes to focusing on a good defense to outlast your opponent. They can prevent damage taken or disable the enemy, preventing them from attacking in the first place. Water and Air are focused on attaining victory through gaining control of the conditions of battle. These elements are good at both offense and defense, but can dictate the circumstances of a given situation to ensure they come out on top. There really isn't anything new here in terms of game progression. This system has always been in place, but now players will be able to see their options in a much more tangible and conscious way. The game has always been designed for progression through level 5 (best done with primary subclass) and confrontation of the enemy after 5 (best with special subclass). Your strategy may differ, and that's where the system shines. The consideration for subclasses came off the heels of the bigger question was that if we release 6 element and 6 sideboards, could you use one elements sideboard with itself, and why would you want to? Would there be any strategic advantage or noticeable play-style shift if you replaced a number of your cards from your fire deck with cards in the fire sideboard, for example? We believe the answer should be "yes". A standard deck (now 64 cards) will contain 2/3 primary subclass weapons and 1/3 special subclass (again, like they already really do). The flexibility comes with the sideboard. Each element will have a 21-card sideboard filled with 1/3 decks with of more special subclass cards. These special subclass cards would focus its own element more heavily towards the core strategy, or provide a significant strategy shift to another element. Below is what this will look like in the game. Here we have two level 4 Water weapons, Harpoon and Moon Staff. Harpoon falls under Water's primary subclass "Lancer". Moon Staff falls under "Sorcerer". As you can see, lancer is more focused on direct attacks, best for defeating creatures quickly. Yet the weapon still maintains traits that are very characteristic to Water, like causing the LIFT status effect and removing a Creature's from battle, giving you control of the flow of battle. Moon Staff is still great for damage but includes the best examples of controlling the flow of battle through card manipulation (Water's speciality). Moon Staff is also a great sampling of Water's ability to spread damage across multiple enemies. The beauty of the game is that you can really do whatever you want. A player wouldn't add Light cards to a Dark deck because you need to do more damage. They would most likely add Light cards because of Light's defensive properties. Either way, we wanted to give the player the ability to see their options more clearly. You can build a deck full of primary subclasses (Lancer, Ranger, and Knight) for example, and you would probably do very well. The point is that you can reach out and touch your decisions. You become conscious of what you're building and gain greater control over your deck. We're really excited for what this refinement will bring to Destined Legends. Check back in with us next week was we talk more about ability types and some new stuff with Status Effects. We have been working very hard over the past 2 years on the evolution of Destined Legends. This week we are showing you how that evolution manifests in the design of the card. And here it is. Behold, the revamped Destined Legends card design. So there obviously a lot to unpack here. Lets start with the look. The original cards were an incredible feat of design. They managed to deliver a lot of important game information in an easy to read and beautiful design. The design goal was clear. Design something that had personality, was easy to read and understand, and maximized the artwork. We managed to cover over 40% of the face of the card with artwork, and our cards look incredible for it. One are of opportunity for the original design was its printability. In other words, the card looked incredible on our computers and online, but it turns out that it lost some of its design luster in print. We came to learn that heavy design elements like gradients and shadows don't translate to print as well as we would prefer. In a perfect world, we would print our cards at 1200 dpi resolution and the cards would look as stellar as they look digitally. Design something that had personality, was easy to read and understand, and maximized the artwork. So we re-approched the design. We wanted to stick to the core of our design; what made Destined Legends stand out. We decided to keep the strong and clear typography and bold top-bar design. On top of that we worked in harder lines and more subtle gradients. We also took the opportunity to make certain elements more clear and identifiable. The damage of an ability is now more integrated into the main ability name bar, giving more space for the description below it. Harder black lines separate the abilities more clearly to avoid confusion and clutter. The overall design is much cleaner, but still distinctively Destined Legends. The result is a design that will print much sharper and easier to read during play. Below is an example of a card from Genesis that has been rebalanced and presented in the new design for Lineage. This is just the beginning of our journey through revealing the awesomeness that is Destined Legends: Lineage. Stick tuned for next week's update as we begin to explore the evolution of gameplay and mechanics. Last week we revealed the official name for the second series of Destined Legends, called Lineage. To get some perspective on todays update, lets travel back to 2013. The development of Destined Legends was a very intensive and lengthly one. The nature of the game meant that there was a lot of considerations to make. There isn't anything out there quite like DL, so most of the mechanics were developed from scratch, then balanced over the course of two years. Due to this fact, along with budget considerations, we decided to focus our efforts on releasing a game that was as fine-tuned and balanced as possible. This lead us to focus on two elements, Dark and Fire. Thanks to an unimaginably successful Kickstarter campaign, we were afforded the ability to also dabble in Water and Earth, but thats all it was, a dabble. In the end, we released Series 1 of Destined Legends, and named it Genesis. It featured 75 unique cards across the four elements mentioned above. As you might be able to tell from the very nature of Destined Legends, we have a strict go big or go home policy at Decobot. That's why for the past couple years we have been hard at work, developing the game for an admittedly ambitious follow-up. Lineage will contain 251 unique cards across the 6 elements of Fire, Dark, Water, Earth, Air, and Light. The cards will feature more Legends, more Weapons, and more Items than before per element. There are also some new card types that we'll touch on in future updates. Our stance with collecting Destined Legends has been, and always will be, that you should be able to be able to directly purchase all cards of the collection. We don't want the person who had invested the most money in randomized packs to be the most powerful player. Destined Legends is a game of skill and strategy, and there is no better test that having everyone on an even playing field. In Lineage, every card that is considered important to the game will be purchasable. All cards will fall into one of three "Ranks". The Ranks are Core, Epic, and Promo. "Core" cards are all of the cards that are essential to the game. This will make up the bulk (about 80%) of the collection. "Core" cards will be available through the purchase of the Lineage line of products. "Epic" cards are cards that are about 20% of the total collection. (think rare or ultra rare from other card games). "Epic" cards are not necessary to the game, but will make for some exciting and... well... epic additions to the game (Think Daxtes, Glass Dragon, and Jacqueline from Series 1). Epic cards will be attainable through some fun and exciting new ways that we are not quite prepared to announce right now, but the important thing is that it will be sure-fire. So if you are a collector, you will get them. There will be another surprise in store for "Epic" cards, more on that later on. "Promo" cards are the cards that are made for special events and promotions and will never be available for sale later on. We'll talk more about promo cards as we get closer to release, but they are designed to be outside of the numbered collection. The takeaway is that will be able to collect all 251 cards for far far far less cost than you would in a typical trading card game, and I think we can manage to make it feel just as special. Having said that, we know that some people like the idea of collecting via random packs, and we like how that can make special cards... well... special. Because of this we are working on some exciting things that will exist outside of the game to satiate that appetite. More on that in the not too distant future. As we continue to fine-tune the game, we found it necessary to revisit the Fire and Dark cards, released in Genesis. We have done extensive testing on all previous cards and have already made some adjustments to bring them more in-line with the balance of the rest of the elements. The vitalness of the re-release of these cards will become very apparent as we continue to reveal more of whats new in Lineage over the coming weeks. To differentiate repeated cards from their Genesis counterparts, we will strive to provide new artwork or most of the cards. This will help keep Genesis cards more collectible and unique. The key thing that you will undoubtedly want to know is that all cards from Genesis will be compatible with the cards in Lineage. We're not reinventing the game, just embracing the natural evolution of the series. There is much more information about the next series of Destined Legends that we will be discussing in the upcoming weeks so stay tuned. Next week, we will highlight some of the design evolutions in Lineage. For the past two years we have been hard at work, developing the next step in the Destined Legends journey. What started as an expansion, very quickly evolved into a gigantic evolutionary leap forward. We hope that this new journey will bring the ultimate, and definitive Destined Legends experience to everyone. I am excited to announce the second series of the Destined Legends card game, titled Lineage. Over the next couple months we will be outlining all of the new hotness with this next series. Lineage is still in development and will be for some time. Since we see this as the definitive Destined Legends experience, we want to do it right. The community will have an awesome opportunity to shape Lineage is a very real way. We will spend the next 7 weeks outlining each new evolution in Destined Legends: Lineage. We will outline a new topic every week, Wednesday at 9AM, starting this week. So be sure to check back every week for another tasty nugget of information. We will also be outlining the new features, as they are announced, over at the official Lineage page. There is a lot of exciting topics to discuss, and we look forward to hearing your thoughts. Until then, check out the teaser below. This week I am happy to announce that we will finally be delivering to you our official Learn to Play video series. This series of videos comes after much anticipation, but they have been worth the wait. We are making the final preparation to the videos and will post them over the next couple weeks to our new YouTube page. If you fancy yourself a YouTube junky, be sure to click on over to our page and subscribe to get all the videos delivered to you as they go live. We will also be posting them to our handy dandy Guides page, so look out for them there as well. I hope your interest is peaked. We're all barely containing our excitement on this one. There are some great things ahead in the world of Destined Legends. That time has come again. Where all of the coolest people gather in over-crowded musky rooms to experience the latest and greatest in the popular arts. We're kicking off our summer with a triumphant return to Phoenix Comicon. We're gonna keep the awesome pumping this year at our booth in the exhibition hall, so be sure to visit us. (There just might be a sneak peek of sorts waiting for you when you arrive. We will be at the show for the full run, May 28-31 at booth 10074. We're closer to the main entrances this time around so we should be easy to find. We've provided the customary exhibit hall map to aid in your search for legend and glory. Also be sure to keep your ear close to the proverbial internet ground for an announcement next week. See you there and stay Legendary. To get the 30% off, use coupon code FREEZE when prompted at checkout. You can use that code along with another coupon: free US shipping on orders over $75 now! Use coupon code SHIPME. It will let you use both. Thanksgiving Weekend Sale is Back! For the first time, we're offering all Destined Legends game products 50% off. That mean you can get the game for you and a loved one. or simply someone you want to decimate in battle. The prices will be adjusted in the store during the sale. We're excited to announce that Destined Legends is now available to purchase on Storenvy.com and Amazon.com. Storenvy is an incredible shop community filled with talented creators. Explore around the site and you will surely be lost for hours. Our Listing on Amazon will help you shop with ease. Hey everyone. As you may know, the team is currently in the thick of development for Series 2 of Destined Legends. This next series is shaping up to be epic and we will have lots more information over the next couple months. Until then, we need your help. 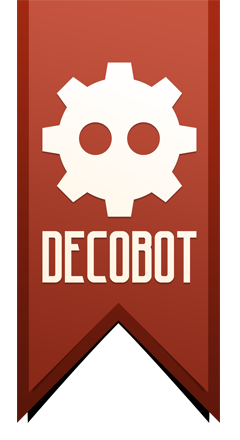 Decobot at San Diego Comic-Con International 2014! Decobot is going to be exhibiting Destined Legends at San Diego Comic-Con International 2014! The show will run July 24-27 at its usual place at the San Diego Convention Center in California. Although this is our second year exhibiting, it's our first on the main show floor!